Alora at Talega Celebrates Model Grand Opening This Saturday, April 26th at 10 a.m.
SAN CLEMENTE, CA--(Marketwired - Apr 22, 2014) - Alora is exquisitely the first of its kind and homebuyers will finally get an inside look at this magnificent new home neighborhood during the Model Grand Opening Celebration this Saturday, April 26th. Homebuyers are encouraged to arrive at 10 a.m. for the first opportunity to tour the three professionally decorated models and enjoy refreshments and entertainment while getting a taste of the spectacular Talega lifestyle. The prime location, stunning new designs by William Lyon Homes and a limited offering of just 36 single-family detached residences make Alora the hottest new home buy in town. For more details, visit www.LyonAlora.com. Prices for Alora are anticipated from the low $1 millions. "Talega luxury has a new name," said Lesley Pennington, Vice President of Sales for William Lyon Homes. "Our Grand Opening will be a defining moment for homebuyers as they discover Alora's grand designs, rich interiors and outdoor living spaces to bask in the coastal climate." Alora's luxurious home designs suit the beauty and prestige of Talega, where the quintessential Southern California lifestyle is fully realized. Two-story floorplans range from approximately 3,949 to 4,503 square feet, with up to 6 bedrooms including first-level bedroom suites, up to 6.5 baths, optional outdoor kitchens and a host of desirable features. Unique garage configurations include 2-car garages + 1-car separate garage to 3-car tandem garages + a 1-car separate garage. Optional wine storage, butler's pantries, guest suites, studies, expanded great rooms and balconies are just a few of the luxe features homebuyers will embrace in varying plans. Alora will also offer a new level of flexibility, with countless room options that allow homebuyers to alter key living spaces as needs change over time. Talega of San Clemente is conveniently located three miles from the Pacific Ocean. Residents enjoy a variety of parks and recreational amenities, including 2,000 acres of open space and trails and the Talega Golf Club with its 18-hole, Fred Couples "Signature" championship golf course and Signature Grille. Among the privileges exclusive to Talega residents are the Talega Swim and Athletic Club, which has a clubhouse, multi-purpose sport court, sand volleyball courts, junior Olympic pool, resort pool and Splash and Play area. The community is within the Capistrano Unified School District that has two elementary schools and one middle school in Talega. Residents also have easy access to shopping and dining at the Talega Village Center. To reach Alora's Model Homes and Sales Gallery, travel south on I-5, exit Avenida Vista Hermosa and turn left. Turn left on Avenida Talega, left on Camino Viento Fuerte East and left again on Via Paulina to the models. 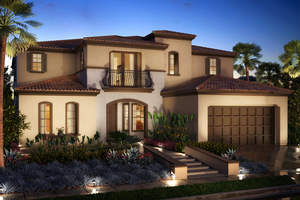 The Model Homes and Sales Gallery are open daily from 10 a.m. to 6 p.m. For more information, please visit www.LyonAlora.com. Don't miss Alora's Model Grand Opening Celebration this Saturday, April 26th at Talega in San Clemente.